Anyone who's ever spent a summer in the Middle East knows how devastatingly hot it can be. One summer I was studying in Beirut when the city was plagued with power outages and humidity seeped in through every crevice. When the power would go out, leaving us without even hope of a fan, about the only thing we could muster up the energy for was a trip down the road to the local ice cream shop. Needless to say, we ate a lot of ice cream that summer and did very little studying, in part because it was so hot, and in part because the ice cream was soooo good. From almond to mango, I sampled them all, but it was the wonderful creamy-chewey texture that captured my heart. There was always a line outside the Bliss Street shop, even into the wee hours of the morning, and they always managed to keep the lights on no matter what the power supply. I wanted to create an ice cream recipe in tribute to those Lebanese who maintain a zest for life no matter what it throws at them. However, recreating Arab-style ice cream at home turned out to be harder than I thought. First, the ice cream is made with mastic and sahlep, two ingredients that can be very hard to find. Mastic (also called gum mastic) is the resin of an evergreen shrub and has a unique enjoyable piney-taste (read more here). Sahlep is the powdered root of an orchid plant and has strong thickening abilities, kind of like arrowroot powder. The ice cream is made with all milk (no cream) and is able to stay creamy when frozen because of the thickening powers of sahlep, it even takes on a remarkable stretchy quality and and you'll see vendors kneading and stretching the ice cream at famous ice cream parlors like Bekdache in Damascus or dondurma vendors in Turkey. Finding sahlep proved to be very difficult (most of what's offered in stores are sahlep drink mixes), and I had qualms about working on a recipe most people wouldn't have access to. The solution came when I was reading about Sicilian gelatos. Back in school, I had studied about the Arab influence on parts of Italy, Sicily's Egyptian-Mamluk architecture, as well as the influential trade between Damascus and Venice. In Sicily, where it is thought ice cream was first brought by the Arabs, the gelato is made using all milk and thickened with cornstarch. Aha, I thought, cornstarch must have been the local answer to sahlep thickener. Another theory I heard was that Sicilians eschew the eggs and heavy cream present in Northern-style gelatos because it is easier to digest in their hot cimate, something which certainly applies to the Middle East. 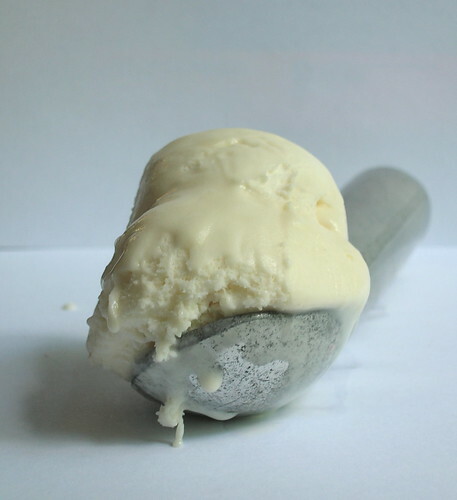 I toyed around with an ice cream recipe using cornstarch, and I was finally able to come up with something with a remarkably smooth texture and great flavor, somewhere between a light ice cream and a floral sorbet. It is important to cook the mixture thoroughly to remove any floury-taste from the cornstarch, or you could use arrowroot powder if your prefer. I'm still yearning to recreate the Arab-style ice creams I love, but this will hold me for now. And if there's one thing I learned living in a power-outed Beirut it's the art of making do. And of eating ic cream. If you want to try your hand at ice cream with mastic and sahlep, I highly recommend this Booza al-Haleeb, as well as this Rosewater-Mastic recipe. Or, check out this Salon article about Orchid ice cream and Harold McGee's column on dondurma. Inspired by Arab-style milk ice creams, I've adapted this so that it can be made with widely-available ingredients, but it still retains it's wonderful floral air. Though I've chosen orange blossom water, you could also flavor this with rose water and pistachios, or even infuse it with saffron. This ice cream does well when adapted with lower fat varieties. 1. Stir together the cornstarch and heavy cream in a bowl, making sure there are no lumps. Place the milk and sugar in a saucepan and bring to a boil, stirring so that the sugar dissolves. Remove from the heat and stir in the heavy cream mixture. (If using mastic, grind it with 1 tbl of sugar and add it here). Return the pan to the stove and cook over moderate heat, stirring constantly. Let the mixture simmer for several minutes, until thickened slightly. Taste the mixture: make sure it does not have any floury taste, if it does, continue to simmer it until the cornstarch is cooked. 2. Remove from the heat and add the orange flower water (or other flavoring of choice). Chill the mixture thoroughly in the refrigerator, then churn in your ice cream maker according to your manufacturer's directions. 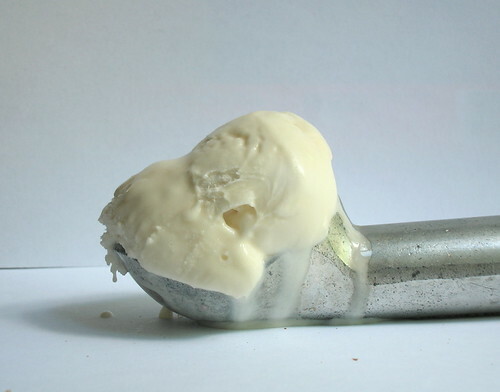 I'm loving your ice cream photos! I just wish I could taste them. This series is great! I actually just made a rice pudding ice cream that was heavily laced with orange blossom water (recipe on my blog). It's nice to see someone on the same wavelength. keep it up! Italy like much of Western Europe inherited all these great Arabic influences and elements via the Southern Mediterranean. These flavors are typical of Morocco, Tunisia, Turkey, Syria, and Iran. Mastic gum (mastiha in greek),comes exclusively from Chios,Greece.The mastic tree,grows all over the Mediterranean but the mastic gum comes only from Chios,Greece.Middle East countries(including Turkey)do not produce mastic,the import it from Greece.Do not confuse with other tree resins. I tried this recipe with lighter cream & custard cream (crème anglaise) instead of the milk - delicious! Thanks. Day 15: Can you guess the flavor?